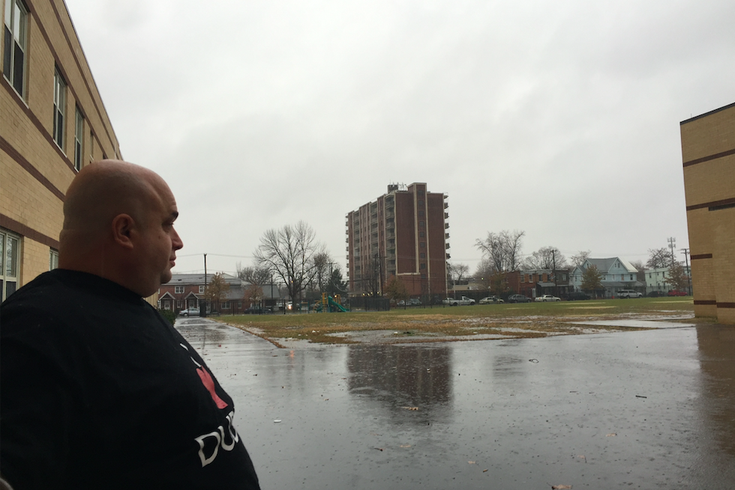 Joe Inverso, a teacher at Thomas H. Dudley Family School in Camden, was tasked with establishing a soccer team for fifth- to eighth-graders earlier this academic year. Thanks to the kindness of friends and strangers within South Jersey's soccer community, it will start up as early as the first week of December 2018. Here, he looks out upon the field where the new Phoenix team will play. Last year, Thomas H. Dudley Family School Principal Gloria Vega approached Joe Inverso with an idea. Students play a lot of soccer during recess at her school at Marlton Pike and Berwick Street in Camden. 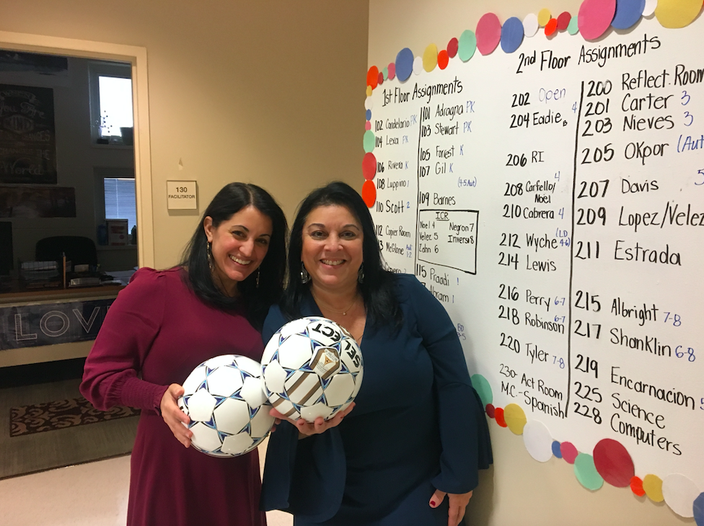 The question she posed to Inverso, an eighth-grade special-education teacher also known as the school's "soccer guy," was along these lines: Can we start up a team to channel their interests into something more formal? Those concerns helped keep the program on the ground last year at the school, which has a Phoenix as its mascot. Last month, though, something changed. Inverso, who both played and coached soccer at nearby Camden Catholic High School to the point that his wife calls him a “soccer snob,” started brainstorming anew. He realized the interest amongst fifth through eighth graders was such that participant numbers wouldn’t be an issue. Players are one part of the equation; equipment and financial backing are equally important. “I need money,” he told Vega, whose school is located just two miles away from where noted soccer enthusiast Joel Embiid and the Sixers practice another sport. “Well, you have none,” she responded. That reality could have been a setback, but now it's one that draws laughter from Inverso. Thanks to the kindness of those who aren’t content to let youth soccer’s “pay-to-play” dynamic prevent children from learning the sport, however, it wasn’t. One Thursday morning in October, Inverso took to Twitter with a call for help. He knew how it important it could be to some of the children since "the only time I really felt good (as a youth) was on the soccer field." He thought, perhaps, some parents and others might be able to donate used equipment like shin pads, cleats and soccer balls. "The reaction took me by surprise," Inverso said. "The South Jersey soccer community really gravitated to it." Offers poured in: 30 new soccer balls from a donor in Riverside, new cleats and socks from Cherry Hill, field time from an old friend in Haddon Heights and anything that might have fallen through the cracks from Haddonfield. Among those who responded was Mayor Ted Brennan of the nearby borough of Merchantville. Brennan told PhillyVoice this week that though his social-media response came from his "official" account, he responded as someone who's known Inverso and his family for nearly three decades now. 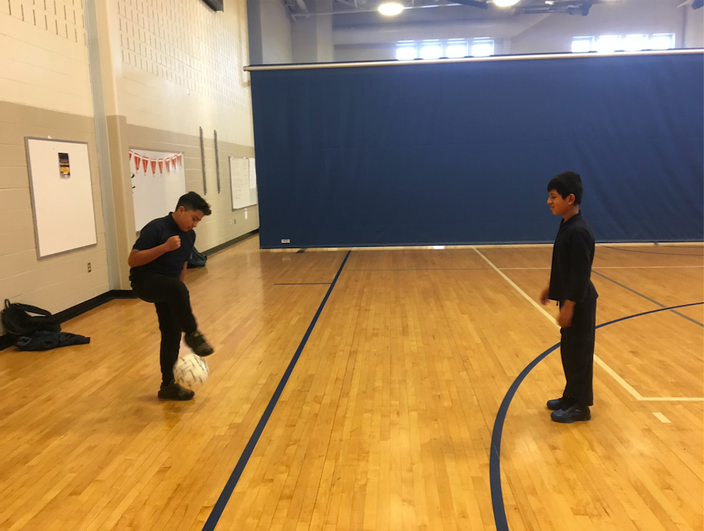 Even before the formation of the soccer team at Thomas H. Dudley Family School, students showed their love of the sport during recess, playing both indoors and outdoors. "As someone who appreciates and played the game of soccer throughout my life, I have an understanding of what a great sport it is," he said. "When I saw Joe was trying to put together a program, particularly in the city of Camden, I felt compelled to find a way to donate to the cause and help him accomplish his goal of creating a program." "I believe it is important to provide the students an opportunity to engage in an activity, a sport, or a program and I saw this as a chance to try and make an impact, even if just a small one." To that end, he and friend Scott Ward purchased shin guards for the entire program and he's also reached out to his children's club to see whether there's anything else they can do. "I wasn't expecting brand-new equipment from all over the place," Inverso said of donations which will help his largely Hispanic student body pursue the game they already love. Already, 30 students have signed up for the intramural program, which will start with indoor practice to teach basic skills and then head out on the field behind the school when weather and conditions permit. They'll have kick-arounds on Saturday and participate in the one-day tournament held in Camden in the spring, all the while keeping academics in mind. Inverso's ultimate goal is to expand the program to grades lower than fifth. "The school opened nine years ago and we're on our fourth or fifth principal. When Ms. Vega took over, she took ownership of turning the academics around. So, these will truly be 'student athletes' on the team," he said. "We expect the grades to go up, too, because we're integrating academics into it." Even the administration and faculty of Thomas H. Dudley Family School have soccer fever. Pictured here, from left, are Nicole Almanzar, the school's lead educator, and Principal Gloria Vega. Vega agreed, saying that she sees soccer as a way to help "our scholars achieve our goals." "As you know, young children are extremely impressionable and it is vital that our school help foster positive growth," she said, citing a school "environment that exhibits a strong support system, focuses on community values, and ignites a desire to achieve personal and team success." To the principal, it's all about a sport instilling team building, personal drive and community pride. "With the guidance of Mr. Inverso as the soccer coach for Dudley, we can impact and shape positive foundational values carrying over into future generations of athletes, scholars, and community members," she said. "Many of our scholars are limited with access to extracurricular activities outside of the school setting. "By having the soccer program at their school, scholars are being given an opportunity that might otherwise may not occur for them." In other words, this isn't just about athletics. Inverso's official title is eighth grade "inclusion" teacher, which is a special-education position that builds off his previous teaching experience at The Bancroft School. As such, the soccer program is open to everybody whether they learn in the school's autism program or face behavioral issues. There's even a student in a wheelchair who wants to play, and Inverso has reached out to the Special Olympics for suggestions of how to turn that hope into a reality. "We'll find a way to make that happen," Inverso said. "We're a family school, and families don't exclude kids. We just want to give the kids a place to play. I learned all about teamwork and working together from soccer when I was younger. This is something that they can hold onto for the rest of their lives." He also noted that the program could help expose students to opportunities they wouldn't have otherwise. "There are a lot of kids out there with a lot of talent. They're just raw. They need an opportunity," he said. "Will they play in high school? I don't know. College? Maybe not. Go pro? Very few do. But, we just want to get them playing." And next week, thanks to donations from across South Jersey, that's exactly what they'll start doing.